Many can’t take off from the ground: Their wings don’t produce enough lift for takeoff from a standstill and they can’t run fast enough to gain speed for lift. It takes less effort for them to simply let go from an elevated position and fall into flight. If you placed a bat on a flat surface, he’d walk to the nearest vertical surface and climb it. Do bats use bat houses? Habitat loss is costing bats their natural roosting places at an increasing rate. Size, placement and habitat are important if you’re to succeed in attracting bats. They seem to prefer a bat house that’s at least 14 to 18 inches wide by 2 to 3 feet tall, placed 15 to 20 feet above the ground. The success rate is only about 25 percent for smaller houses, and not much greater for large bat houses. Place it near water and at least 20 to 30 feet from the nearest tree. On the south or east side of a house, shed or barn is a perfect place to hang it, as predators won’t be able to reach it. Bats like warmth, so their house needs six hours of direct sunlight every day. Make sure it’s ventilated. The bigger the bat house, the bigger the colony it can support. 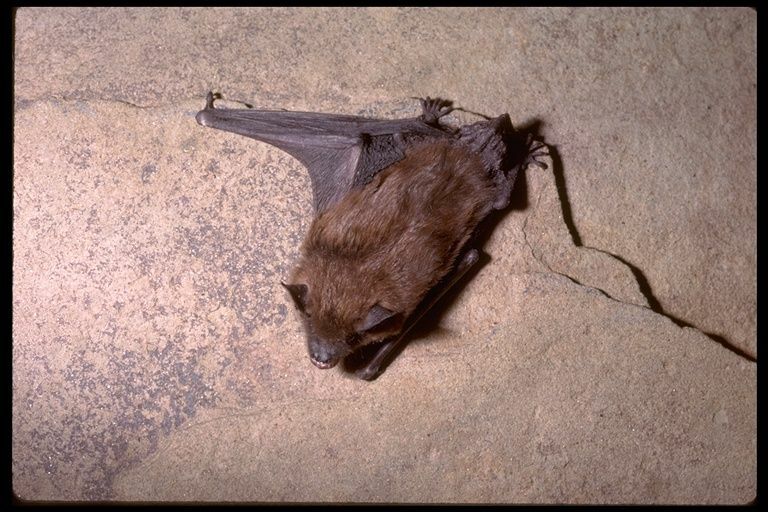 Some species known to use bat houses are the Big Brown Bat (Eptesicus fuscus), Little Brown Bat (Myotis lucifugus) and Southeastern Bat (Myotis austroriparius). Assuming you do everything right, it still may take a year or two before bats begin to use it. As with other wildlife, never evict bats during their maternity season, which is around April 15th through August 31st. The young, called pups, cannot fly and will die. Also avoid evicting bats in winter, as you’ll be forcing them out during their hibernation period into temperatures they can’t tolerate, with no ready roost and no food source (insects). Late fall is the best time. Bats aren’t aggressive animals; they’ll leave you alone. It’s only a little wait on your part and will save their lives. Here’s how to evict them, according to the Organization for Bat Conservation: Enlist the help of several friends to each watch a different side of your house from dusk until one hour after sunset. The goal is to find the opening(s) being used by the bats. Bats are able to get in through a hole the size of a thumb, so look closely and expect them to fly out fast. You may have to do this several nights until you find their opening. Once located, mount a bat house near the opening and the bats will become accustomed to it as they come and go. A week later, during the day, tape a large mesh screen on three sides around the opening(s) into your attic. The screen should extend a foot past the opening on all sides. Keep it loose enough for the bats to crawl out through the open bottom. They won’t be able to get back inside, however, and will look for the closest good place to roost. Hopefully, it will be the bat house you’ve conveniently placed nearby. There! You’ve evicted your tenants and also helped them settle into a new place. Leave the screen in place for another week and then permanently secure it. As for where to place the bat house, hang it on the side of your house or another building, under the eaves and in a spot where it will get a few hours of sun each day. Or hang it on a pole or tree, although tree-mounted houses reportedly have lower occupancy. The house needs to be 15 to 20 feet off the ground. Bat houses mounted in the spring, before birthing time, are more successful. The bats are in your attic because they found a way inside (all it takes is a tiny opening) and it’s becoming a challenge for them to find suitable roosting sites as their habitat disappears. If you live more than half a mile away from open water, you’ll likely never have a bat problem. Bats like forest and water edges, probably because these habitats provide large quantities of insects. A word about bat rabies: Only one-half percent are actually found to be rabid and in all of American history only four cases of human rabies are known to be caused by house-dwelling bats. None of the four were caused by the bats most likely to be in your attic: the Big Brown Bat (Eptesicus fuscus) and the Little Brown Bat (Myotis lucifugus). Not only this, but according to the Federal Centers for Disease Control and Prevention, the Big Brown and Little Brown have never been linked to human rabies. First of all, know that bats aren’t dangerous. They aren’t aggressive, fewer than half a percent are rabid, and even rabid bats won’t attack. He may be zooming all around the room, but he won’t touch you, however close he comes. Bats aren’t blind, he can see you very well. He’s frightened and looking for an exit. Your every instinct may be to wave your arms and try to bat (pun intended) him away, but resist the urge. Pause and enjoy the spectacle. As soon as he locates an open window he’ll be gone. Close doors to keep him confined to one room. Open all the windows (remove screens). Hopefully, he’ll fly right out. If he doesn’t, you can try to catch him. When he lands on a curtain, piece of furniture or the wall, place a towel over him and scoop him up. Or, place a jar over him and a stiff piece of paper under him to trap him. Outside, just open the towel or lay the jar on its side to release the bat. I found an injured bat, what should I do? To find out, we turned to the best source for the answer — Bat World Sanctuary. Founder and bat expert Amanda Loller says bats don’t form flocks in the sense of masses of them traveling together. They fly from their roosting place and disperse. They may stay in the same vicinity of each other, however. Within the dispersed group will be cliques of bats who stay closer to each other. The cliques also roost together within the bat colony. Do bats accept bat “strangers” into their colony? Amanda Loller of Bat World Sanctuary says bats may or may not. There are many factors at play if a bat needs to find a new colony. She says, for instance, some bats, such as the Big Brown Bat, are very aggressive toward unknown bats, while other species are more tolerant. An otherwise tolerant colony might not accept a bat of a different species. Bats are social animals and a rejected bat would keep looking around for a colony that would accept him.